A Card that was Right for me!! This card has been very helpful in helping my business grow. I use it mostly for inventory purchases. I enjoy seeing the little kickback to give me the form of cash back. I hope to continue to grow with them. I use my card on a daily basis to purchase products for my business. I love the reward points at the end of the month! This is a useful to have if you need a business credit card for certain expenses when traveling or in other situations. I wish it had more perks, but it is a good, basic business credit card. Redeem for premium vacation packages, cruises or fly any class on most major airlines. There are no restrictions or blackout dates on airfare booked through Chase Ultimate Rewards®. Will it be Home Depot®, iTunes®, Amazon or Staples®? With over 70 gift card options available, deciding where to redeem your rewards won't be easy. Gift Cards: Subject to availability. See gift cards for details, terms, conditions and (if applicable) fees. All trademarks are property of their respective owners. Product may not be available in all states. The gift cards featured are not sponsors or otherwise affiliated with this company. 1Using your Points at Amazon.com Checkout (Shop with Points): Additional Chase and Amazon.com Shop with Points service terms apply. Learn more about Shop with Points by going to www.amazon.com/chaseinkswp. Some or all documents, services, websites (whether controlled by Chase or others) and/or correspondence may be available only in English. Employee cards at no additional cost Set and change individual spending limits on employee cards,* Same page link to Offer Details and earn even more rewards from their purchases. You will receive 50,000 bonus points with this bonus offer, which can be redeemed for $500 cash back. To qualify and receive your bonus, you must make Purchases totaling $3,000 or more during the first 3 months from account opening. ("Purchases" do not include balance transfers, cash advances, travelers checks, foreign currency, money orders, wire transfers or similar cash-like transactions, lottery tickets, casino gaming chips, race track wagers or similar betting transactions, any checks that access your account, interest, unauthorized or fraudulent charges, and fees of any kind, including an annual fee, if applicable.) After qualifying, please allow 6 to 8 weeks for bonus points to post to your account. To be eligible for this bonus offer, account must be open and not in default at the time of fulfillment. Rewards Program Agreement: For more information about the Ink Business Cash rewards program, view the latest Rewards Program Agreement. We will mail your Rewards Program Agreement once your account is established. If you become a Chase Online customer, your Rewards Program Agreement will also be available after logging in to chase.com/ultimaterewards. Cash Back and Points: "Cash Back rewards" are the rewards you earn under the program. Cash Back rewards are tracked as points and each $1 in Cash Back rewards earned is equal to 100 points. You may see "Cash Back" in marketing materials when referring to the rewards you earn. How you can earn points: You'll earn points when you, or an authorized user, use an Ink Business Cash card to make purchases of products and services, minus returns or refunds. Buying products and services with your card, in most cases, will count as a purchase; however, the following types of transactions won't count and won't earn points: balance transfers, cash advances and other cash-like transactions, lottery tickets, casino gaming chips, race track wagers or similar betting transactions, any checks that access your account, interest, unauthorized or fraudulent charges, and fees of any kind, including an annual fee, if applicable. 1% Cash Back: You'll earn 1% Cash Back rewards for each $1 spent. 2% Cash Back: You'll earn 2% Cash Back rewards total for each $1 of the first $25,000 spent each account anniversary year on combined purchases in the following rewards categories: gas stations and restaurants (1% additional Cash Back rewards on top of the 1% Cash Back rewards earned on each purchase). After $25,000 is spent on combined purchases in these categories each account anniversary year, you go back to earning 1% Cash Back rewards for every dollar spent, with no maximum. 5% Cash Back: You'll earn 5% Cash Back rewards total for each $1 of the first $25,000 spent each account anniversary year on combined purchases in the following rewards categories: office supply stores; internet, cable, and phone services (4% additional Cash Back rewards on top of the 1% Cash Back rewards earned on each purchase). After $25,000 is spent on combined purchases in these categories each account anniversary year, you go back to earning 1% Cash Back rewards for every dollar spent, with no maximum. How you can use your points: You can use your points to redeem for any available reward options, including cash, gift cards, travel, and products or services made available through the program or directly from third party merchants. Redemption values for reward options may vary. Points expiration/losing points: Your points don't expire as long as your account remains open, however, you will immediately lose all your points if your account status changes, or your account is closed for program misuse, fraudulent activities, failure to pay, bankruptcy, or other reasons described in the terms of the Rewards Program Agreement. Rewards Categories: Merchants who accept Visa/MasterCard credit cards are assigned a merchant code, which is determined by the merchant or its processor in accordance with Visa/MasterCard procedures based on the kinds of products and services they primarily sell. We group similar merchant codes into categories for purposes of making rewards offers to you. Please note: We make every effort to include all relevant merchant codes in our rewards categories. However, even though a merchant or some of the items that it sells may appear to fit within a rewards category, the merchant may not have a merchant code in that category. When this occurs, purchases with that merchant won't qualify for rewards offers on purchases in that category. Purchases submitted by you, an authorized user, or the merchant through third-party payment accounts, mobile or wireless card readers, online or mobile digital wallets, or similar technology will not qualify in a rewards category if the technology is not set up to process the purchase in that rewards category. For more information about Chase rewards categories, see www.Chase.com/RewardsCategoryFAQs. Accounts subject to credit approval. Restrictions and limitations apply. 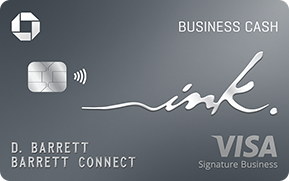 Ink Business CashSM credit cards are issued by Chase Bank USA, N.A. Offer subject to change.